I need to take about a week off to tend to some urgent family matters. When I come back I'll offer you a series of posts about Siberia. Image (credit June Aubrey Young) via the QI elves' (creators of my favorite podcasts) Twitter feed. Pseudopupils are pretty neat. What you're actually seeing is ommatidia that are oriented directly toward the viewer (camera lens). Instead of seeing the pigmented walls of the ommatidium you are seeing right into the photoreceptors. The dark spots will even appear to follow you as you move around the insect but the insect is not actually moving anything. 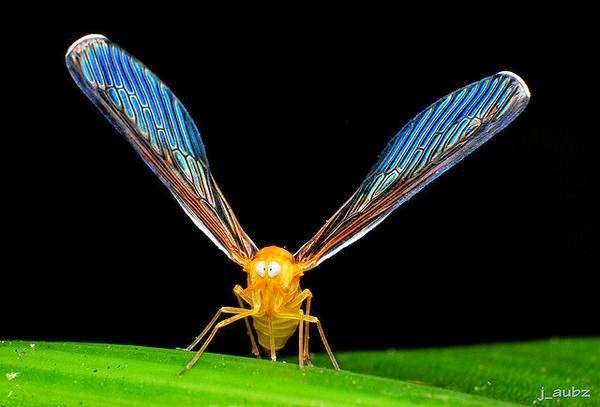 Some spiders can move their retina to look around though, which is pretty awesome. The new online edition makes The Feynman Lectures on Physics available in HTML5. The text “has been designed for ease of reading on devices of any size or shape,” and you can zoom into text, figures and equations without degradation. More at the link. The image is my screencap of part of one of the pages. The study looked at the depiction of seizure care for all episodes of "Grey's Anatomy," House, M.D.," and "Private Practice," and the last five seasons of "ER." The research will be presented at the American Academy of Neurology's annual meeting in Toronto, Ontario, in April. There have been other studies showing that television medical shows do a poor job of portraying procedures appropriately and accurately. Of concern is one about cardiopulmonary resuscitation, or CPR, Sanders said. A 1996 New England Journal of Medicine study of "ER," "Chicago Hope" and "Rescue 911" found that in the episodes viewed, 75 percent of patients survived cardiac arrest immediately, and 67 percent appeared to be well enough to leave the hospital. In real life, long-term survival rates vary from 2 to 30 percent for cardiac arrest outside a hospital and 6.5 to 15 percent for arrests inside a hospital, the study said. False depictions of CPR are probably more alarming than misrepresented seizure care, Sanders said. Normally, seizure care is left to doctors, who don't get their information on treatments from television. But CPR is a procedure that lay people do learn how to do, and they might get false impressions from watching dramas, she said." What the cameras captured is a perilous new prank known as “swatting,” or making a false report to get the SWAT team to invade a rival gamer’s space. As evidenced by the Vice News report below, this can involve disguising the caller identity and making some potentially life-threatening claims. 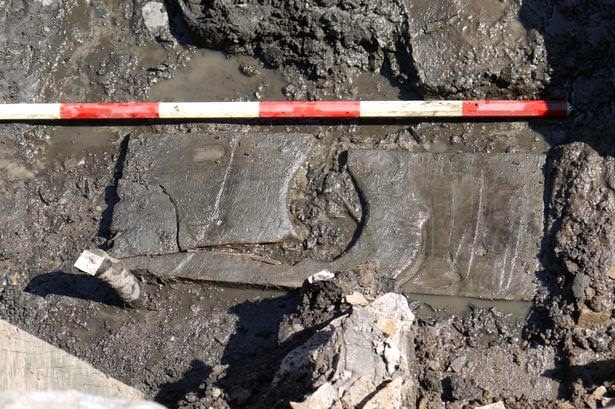 The seat was discovered by Dr Birley in the deep pre-Hadrianic trenches at Vindolanda. There are many examples of stone and marble toilet seat benches from across the Roman Empire but this is believed to be the only surviving wooden seat, almost perfectly preserved in the anaerobic, oxygen free, conditions which exist at Vindolanda. The seat has been well used and was decommissioned from its original location and discarded amongst the rubbish left behind in the fort before the construction of Hadrian’s Wall started in the early Second Century. " "...one way Americans can avoid buying private insurance or paying into the Affordable Care Act. The deal, made possible by a little-known provision in the health-care law, has one particularly important requirement: The Duff household of nine must abstain from general debauchery. Samaritan’s rules, however, extend beyond the religious realm to the practical one of saving money. Sinful behavior threatens more than a soul’s entrance to Heaven, Duff and his cohorts believe: It damages the earthly body — and amplifies the price of health-care. Obamacare, the Samaritan contract states, is undesirable because it covers costs that “result from immoral practices,” such as STD treatments or out-of-wedlock births. The law creates a moral dilemma for Duff, who now works as an assistant pastor in downtown Omaha. “Simply put,” he says, “I don’t want to pay for that or encourage it in any way. Neither do the estimated 100,000 other Samaritan users. 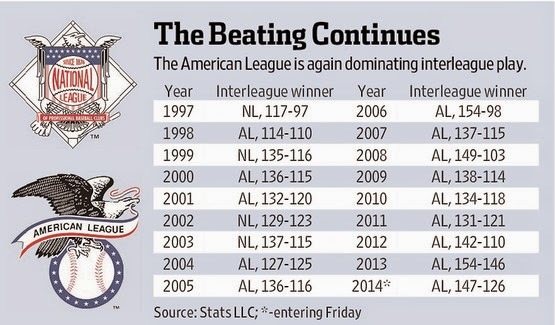 American League teams have won the majority of interleague games for 10 consecutive years; this year will likely be the 11th. 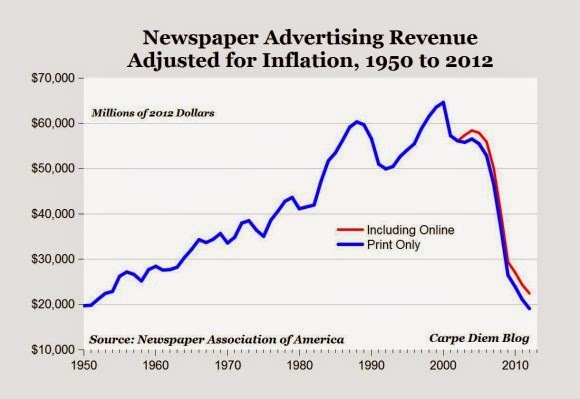 Graphic from the Wall Street Journal, where there is speculation about the reasons for this trend. This video, posted at GrindTV has details and video of the rocks moving. 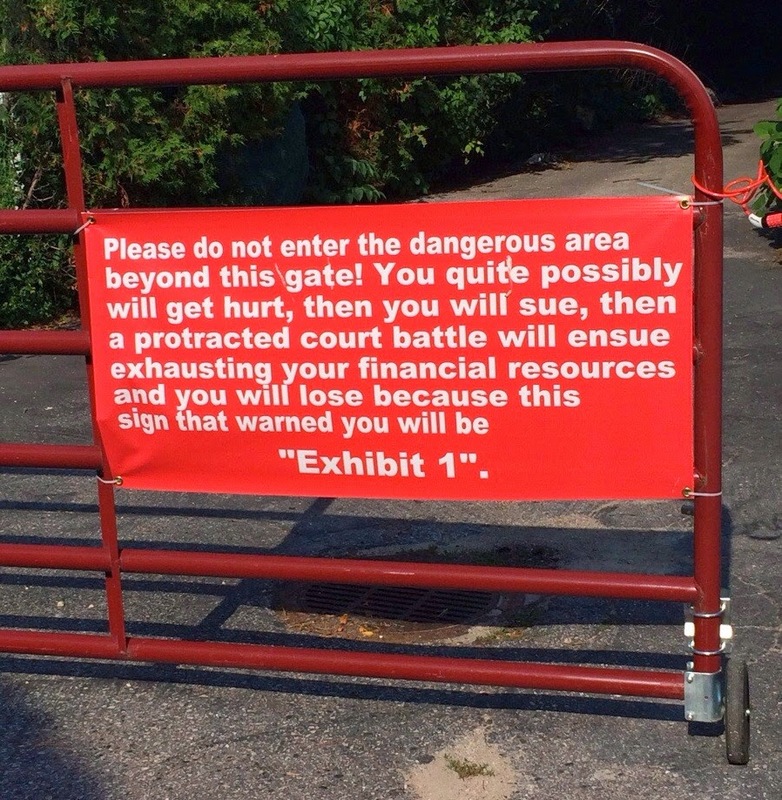 Additional details at that link (hat tip to reader Stan Banos for sending it in). 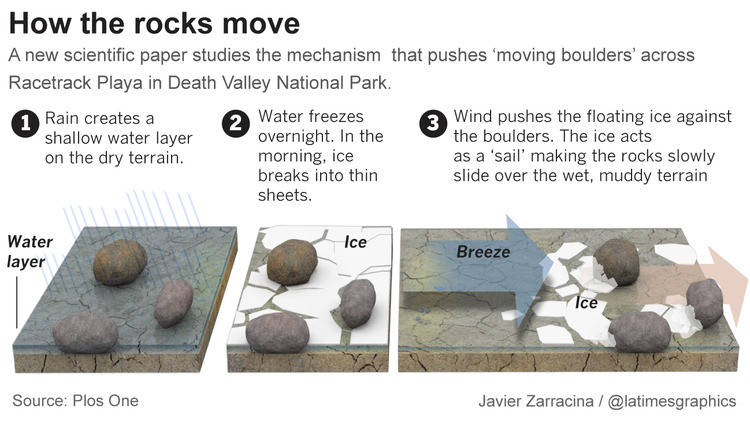 As part of the Slithering Stones Research Initiative, researchers custom built motion-activated GPS units and fitted them into 15 rocks and placed them on the playa in the winter of 2011, with permission from the National Park Service. They expected it would take five to 10 years before something happened. Salting roads in winter can tweak the physiques of butterflies the next summer. Milkweeds and oaks, plants that caterpillars graze on, collected from alongside a country road carried higher sodium concentrations than the same species growing at least 100 meters from the splash and drift of deicing salt, says Emilie Snell-Rood of the University of Minnesota in St. Paul. 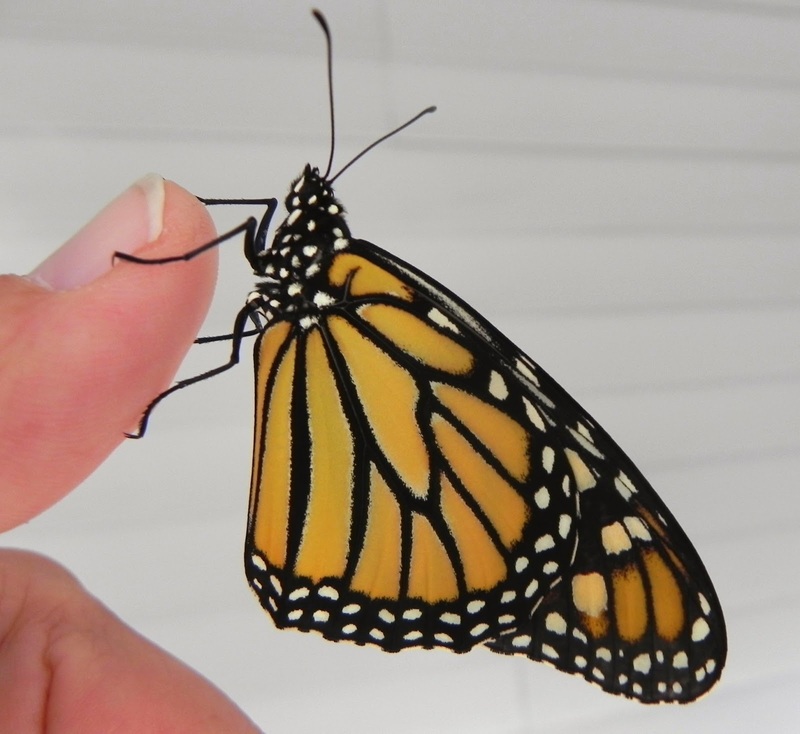 Monarch (Danaus plexippus) caterpillars raised on the sodium-boosted plants turned into males with extra thoracic muscles and females with bigger eyes and probably bigger brains than butterflies reared on the more distant foliage, Snell-Rood and her colleagues found. 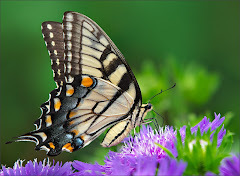 A different butterfly, the cabbage white, echoed these his-and-hers effects when reared on a sodium-boosted lab diet, researchers report June 9 in the Proceedings of the National Academy of Sciences. So is road salt good for butterflies? “I do not want that to be the take-home message,” Snell-Rood says. Instead, she says, the study demonstrates for the first time that road salt can alter how animals develop physically. Text from Science News, with a tip of the hat to reader Bradley Ruben for bringing it to my attention. Photo from our yard. Related: The double-edged sword of salting roads in winter, and Cheese brine for icy roads. The technology is explained in this video featuring tennis coverage. Further details and analysis at Carpe Diem, via The Dish. In the photography category of this blog, I've occasionally posted photos of beach scenes from the turn of the last century, and I suspect a modern person's responses are "what uncomfortable clothing to wear" and "what unattractive clothing to wear." 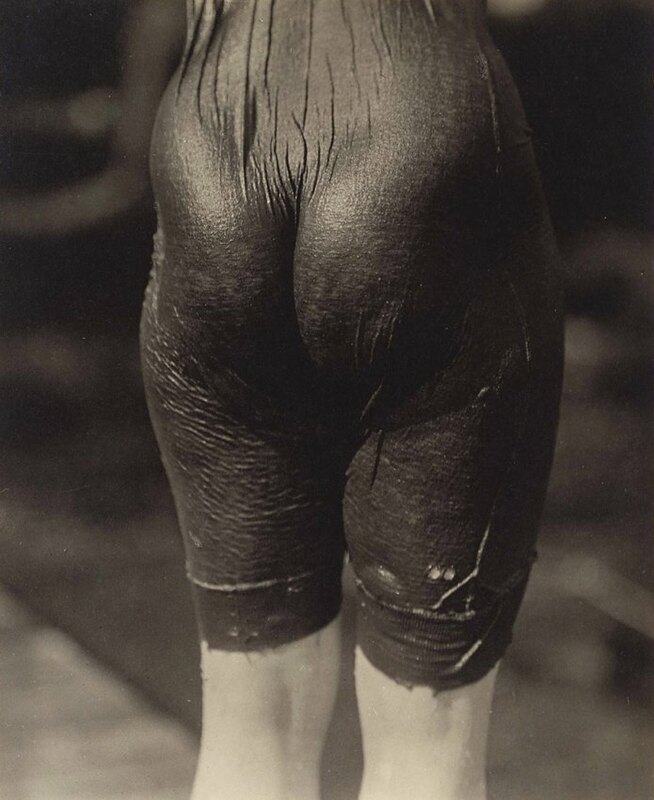 With regard to the latter (?mis)perception, I offer the above photo, from the camera of Alfred Stieglitz (‘Ellen Koeniger’, 1916, gelatin silver photograph, 11.1 x 9.1, J Paul Getty Museum, Los Angeles), as a reminder that when wet, those staid bathing costumes must have shocked some Edwardian-era sensibilities. Found at Consciousness is a Congenital Hallucination. Reposted from 2010 to add a link to another of Stieglitz' photos. The two images have different dates and names, but it appears to be the same suit. 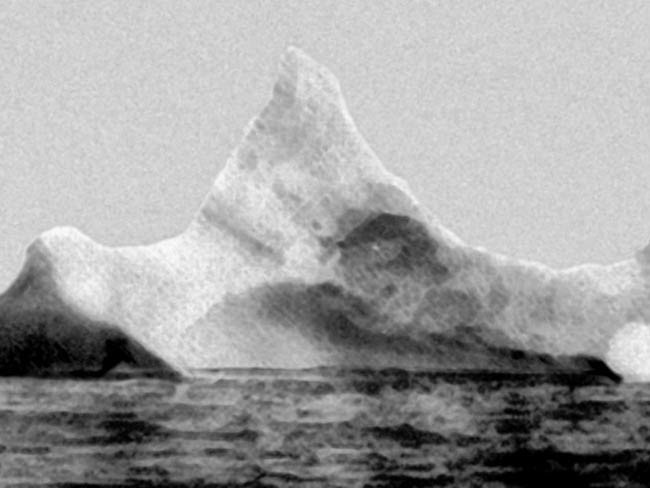 The iceberg lay at latitude 41-46N, longitude 50-14W, off the coast of Newfoundland. Newspaper reports of the time said that the visible part of the iceberg – that above the waterline – was anywhere between 50 to 100 feet high and 200 to 400 feet long. The chief steward on board the Prinze Adelbert liner took the photo of the iceberg on the morning of the Titanic sinking. Reports say he spotted a line of red paint along the bottom of the iceberg which experts believe show where it had made contact with Titanic. Journal.ie reports that the steward was not aware at the time that it had been the iceberg that sunk the Titanic but the location, the marks on the iceberg and Titanic survivors’ descriptions of the iceberg triangulated to confirm that it was. A tip of the blogging hat to the elves at QI, who made mention of this iceberg on their always-excellent podcast. A team of doctors in Nagpur successfully performed surgery to remove the mass that was lodged between the woman's uterus, intestines and bladder. 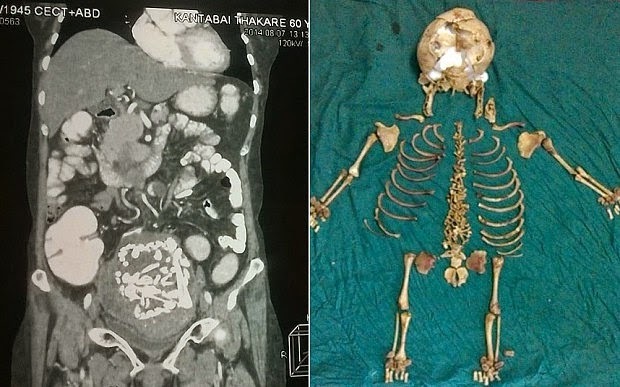 Skeletal remains that were removed are seen in video footage laid out on a hospital bed, and include numerous parts of a rib cage, leg and arm bones and sections of a skull, spine and pelvis. 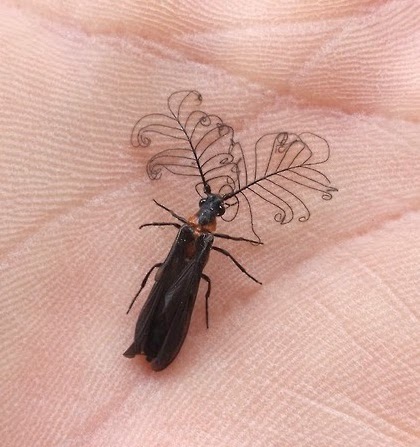 "The beetle family Phengodidae, known also as glowworm beetles." From Project Noah, via A London Salmagundi. You pour the sand in at the top. And it comes out... well, at the bottom. 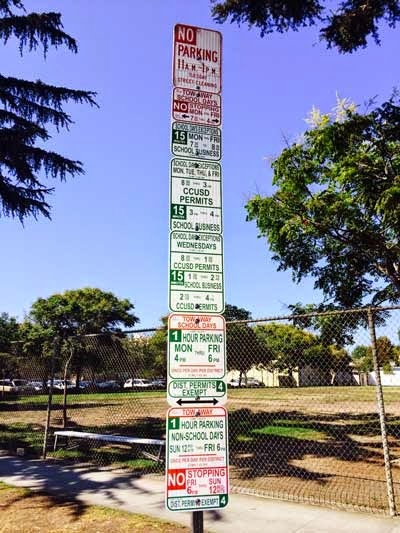 For a brief time Thursday and Friday the parking regulation signs outside Linwood E. Howe Elementary School topped 15 feet. The signs were meant to clarify a new drop-off and pick-up procedure for when classes resume at the school, but as CBS2’s Juan Fernandez reported, neighbors just found them confusing. "A poetic remake of the strategic achievement of Hannibal"
Gimme a break. 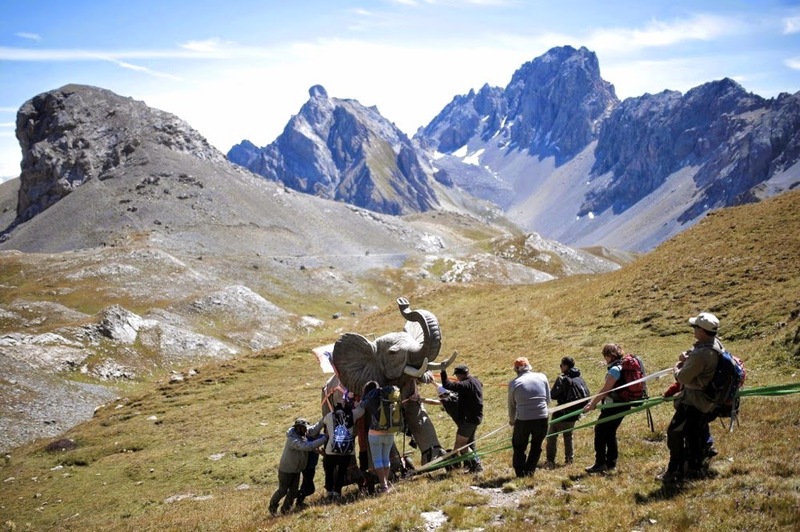 Dragging a replica elephant on wheels along the Cavalla Pass in Italy is hardly a remake of Hannibal's achievement. Via the Washington Post, with an additional photo here. Credit: Marco Bertorello/AFP/Getty Images. Only about 100 of these original "first-phase" chief's blankets are thought to exist. Details at The Telegraph. At the risk of throwing a wet blanket on a feel-good story, one has to wonder whether his ancestor in the 1860s spent four years' salary to purchase the blanket, as is postulated in the video. IVANPAH DRY LAKE, Calif. — Workers at a state-of-the-art solar plant in the Mojave Desert have a name for birds that fly through the plant’s concentrated sun rays — “streamers,” for the smoke plume that comes from birds that ignite in midair. More than 300,000 mirrors, each the size of a garage door, reflect solar rays onto three boiler towers each looming up to 40 stories high. It's not clear to whom the company would pay the compensation. Presumably to the families of the dead birds. Further details at the Calgary Herald, via the QI elves. 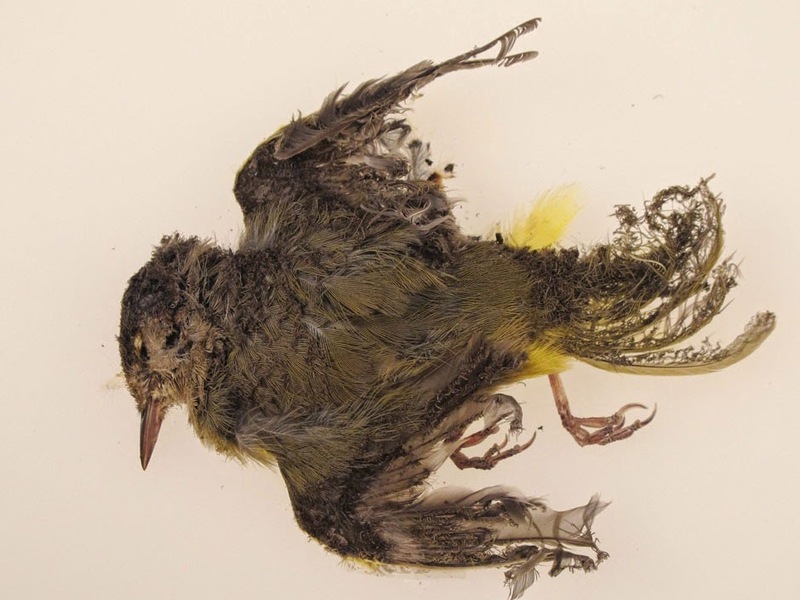 Addendum: A hat tip to reader Wales Larrison for providing a link to a detailed study of avian mortality at the facility. I'm dismayed to note that the researchers also noted significant insect mortality, including many Monarch butterflies. During their next orbit of the dark side the “music” RETURNS. Addressing Tom Stafford this time Gene Cernan asks “You hear music Tom? That crazy whistling?” In which Tom Stafford replies “I can hear it.” Gene replies “that’s really weird” and Tom replies “it is.” Further on Gene AGAIN brings up the subject by stating “Listen to eerie music”. They even continue random dialogue regarding the music and how eerie and weird it was, and that nobody is going to believe them. There hasn't ever really been an "official" explanation of these sounds (described as whistling and buzz-saw sounds). But most scientists offer that it could be attributed to either radio interference in the lander or perhaps an artifact of the Sun's solar wind. Since the most prominent example of this sound was when the Apollo 15 astronauts were on the far side of the Moon, it could be suggested that the Moon's gravity was gravitationally focusing the Sun's wind (a mix of high energy charged particles) onto the capsule. That interaction would created electromagnetic distortions, which could produce sounds inside the capsule. 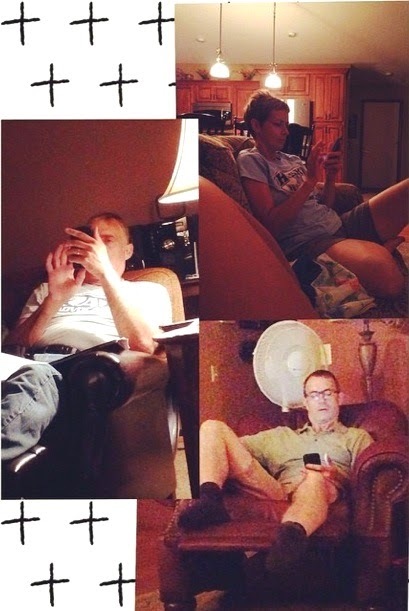 An instagram tweeted by a member of my cousin's family, who was in the process of packing to head off to college and taking some last pix of family she would leave behind. It's sort of meta for me to now post it in the blog for them to see. And now I'll email it to my wife. My 95-year-old mother is forever amazed by "this modern world." 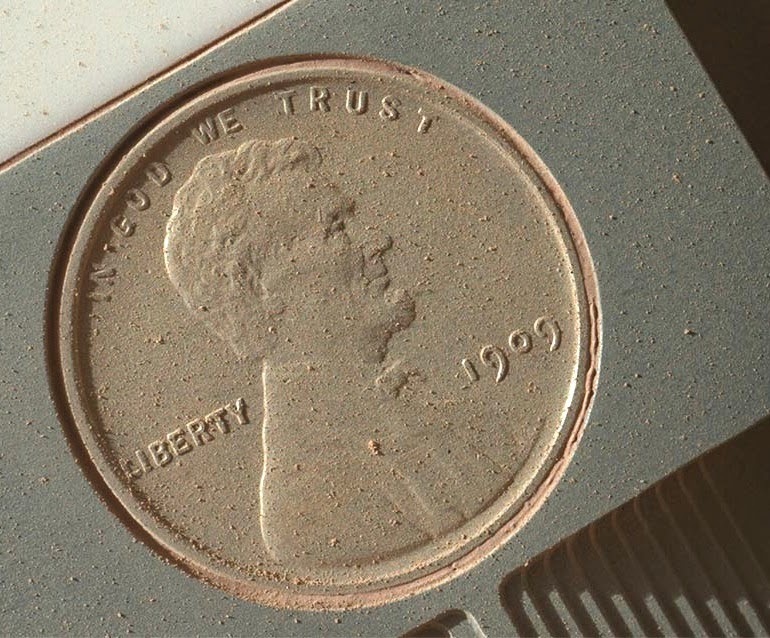 It's a Lincoln head cent, issued in 1909 on the centennial of Lincoln's birth, and the first in a long series of gazillions of similar pennies differing only in date and mint marks. Concealed carry permits - the licences required to carry a gun in public - are issued at state level, and the criteria and rules vary across the US. While there is nothing in North Dakota's statutes to prevent a blind person - or a person with any physical disability - carrying a gun, in Florida, for example, a "physical inability to handle a firearm safely" is listed as a reason for ineligibility. Yet even there, a blind person with a North Dakota licence would still be able to carry his or her gun, since Florida recognises permits from that state. .. It's even more straightforward for blind people to own guns if they are content to leave them at home. In most states, you don't need to perform a shooting test or get a licence to buy a gun. Consequently, no-one knows how many blind Americans own guns for home defence, target practice or hunting. Carey McWilliams started hunting in 2008. When ducks fly across the sky, he says, they make a sound like bicycle tyres on a pavement, and he traces them with the barrels of his rifle. For other types of hunting, such as stalking elk, he goes out with a companion, who whispers directions - up a bit, left a bit, right a bit - but who is not permitted to touch his weapon. ..
At the same time, McWilliams says again and again that he would only use his weapon on someone at point blank range - "I consider my gun a blade with a bang." 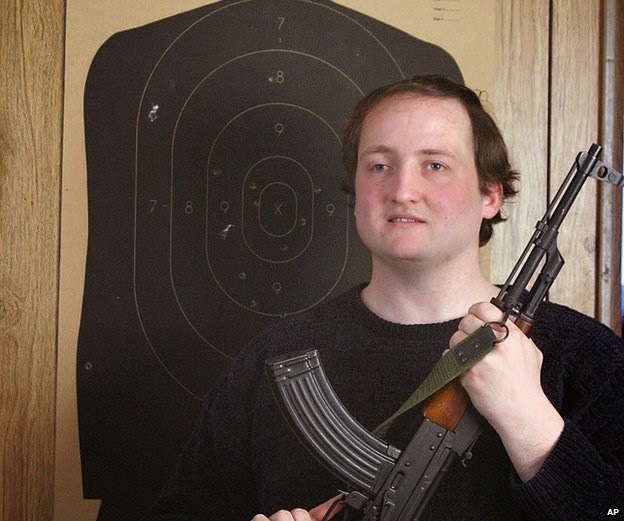 That is the only way, he says, that he can be sure he is under real attack and - his acoustic shooting skills notwithstanding - pick out his assailant. To minimise danger to passers-by, he says his gun is loaded with frangible ammunition, which would be of no danger after exiting an assailant's body. "Surgeons absolutely hate those type of shots that I use because they do a lot of a damage internally," he says. "It would make a bullet wound about the size of a dime and an exit wound about the size of a baseball, and wouldn't go very far beyond that." A young man in Florida is accused of murdering his roommate (details at The Telegraph). Evidence at his trial will include information retrieved from his PDA (screencap above). 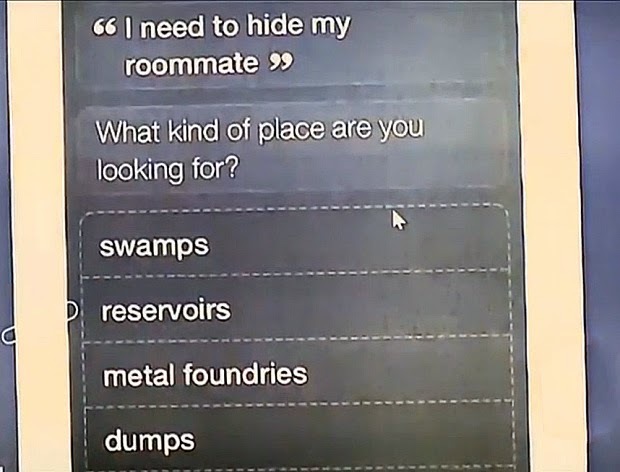 The Siri device, which had been accessed via Facebook, allegedly responded with the question: "What kind of place are you looking for? Swamps. Reservoirs. Metal foundries. Dumps.".. Detectives who accessed Bravo's phone found that he had used the flashlight facility for 48 minutes on the day of Aguilar's disappearance. Upon closer inspection, the workers unearthed several large glass jars containing 16 gold bars weighing 2.2lbs each, and 600 gold coins from 1924 and 1927. The stash had probably hidden for safekeeping during the Second World War, according to Paris Normandie. ...tax officials homed in them after one of the men began depositing high-value cheques, including one for €270,000. Showing once again how utterly, abysmally stupid some thieves are. But I'll bet there are quite a few family fortunes that were created not by a hardworking ancestor, but by a lucky and discreet one. And I'm sure there are more stashes like this one scattered throughout the continent. The StarTribune notes that this "sport" is gaining in popularity on Minnesota lakes. It doesn’t come cheap, though. With the jet ski and all the equipment, he said it can quickly add up to $20,000. In two years of owning flyboards, he’s run through 10 water scooter engines due to the extra wear it takes with the flyboards. He rents them out for $299 an hour. But more and more people are curious about the unusual sport, with Jansen doing 3,000 rentals last year. I'm not thrilled by this development because I've never been a fan of the noise created by jet skis. And I notice that every video I've found replaces ambient sound with hard rock to mask that noise. There are a few details and some commentary at the New York Times; presumably there is more in-depth analysis elsewhere. If you own a house long enough, most of the components will need to be repaired or replaced (a fact often overlooked by young couples eager to purchase as much home as they can afford). Take my driveway. Please. Our house is only about 20-25 years old, situated near the crest of a hill overlooking woods. It's clear that some regrading of the lot was necessary to position it where it is. 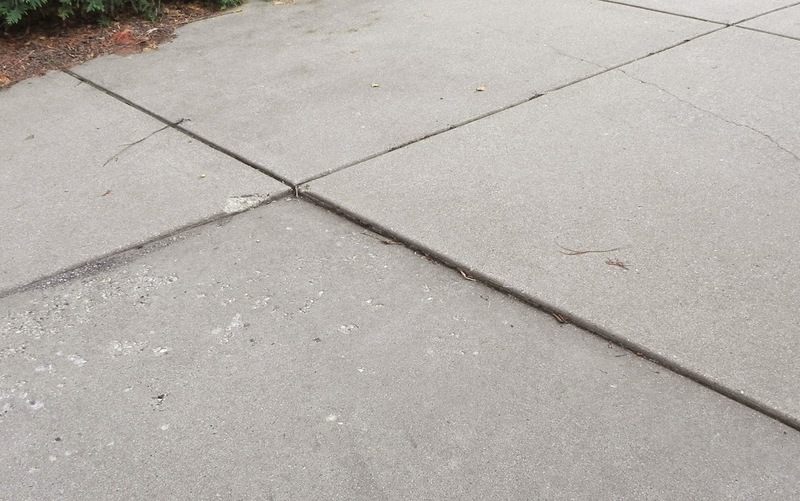 The driveway has a series of concrete slabs separated by tiny expansion grooves. Over the past decade or so, some of the slabs have begun to shift. These depressions first make themselves manifest in the winter when you are shoveling snow vigorously and the shovel comes to a sudden stop, sending a shudder through your body. What's happening underneath may represent a "settling" of fill originally used to level the ground or perhaps some erosion as rainwater and winter meltwater work their way between the slabs, perhaps exacerbated by the burrowing of critters like chipmunks or the action of the roots of some nearby very large trees. "Jacking" the slabs back up is generally faster, less labor intensive, less disruptive, and less expensive (probably by a factor of 3-5X - I'm still studying that) than removal and replacement of the driveway. But when slabs are cracked (as some of ours are), there is a risk that the segments will separate, and even a smooth lift of an intact slab may not align perfectly with all the neighboring ones. I'm writing this post to encourage readers who have dealt with similar driveway/sidewalk problems to respond with comments (for me and for other readers who have - or will someday have- the same problem to deal with), because this isn't the kind of information one learns in school. Success stories and horror stories are equally welcome. Addendum: the embedded video is no longer available. A hat tip to reader Piper for finding a similar one at this UPI link. Eight-year-old Kaleem's hands weigh eight kilograms each and measure 13 inches from the base of his palm to the end of his middle finger. The cricket fan, who lives in India, is unable to do many basic tasks – including tying his shoes laces – and has been bullied and shunned most of his life. He said: "I do not go to school because the teacher says other kids are scared of my hands. "Many of them used to bully me for my deformity. They would say 'let's beat up the kid with the large hands'." The physician in the video is hopelessly out of his depth. This is in no way a case of acromegaly (which is also not a disease of the thyroid). Note the boy also has engorgement of the tissues of his upper chest. I would favor a disorder of his lymphatic system - genetic rather than parasitic because of the early onset. 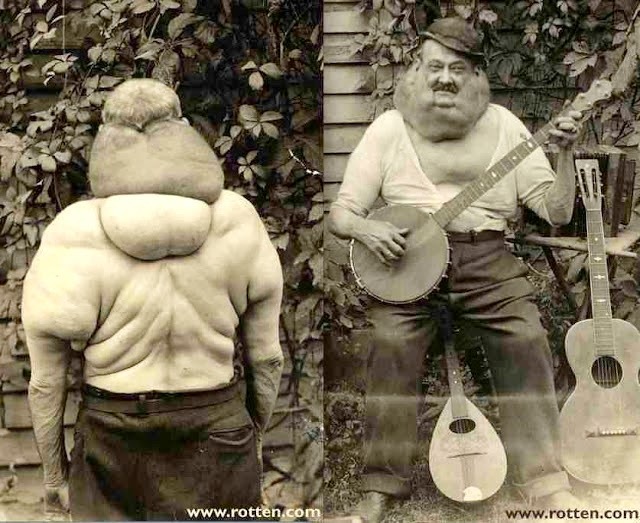 I'm also saddened by the responses of his childhood playmates, whose mockery and aggression remind me of the treatment accorded the "banjo goiter" man whom I previously blogged. Tuberculosis as the cause of the American holocaust? Recent research suggests that tuberculosis spread by seals may have been responsible for the deaths of millions of Native Americans in pre-contact America. Disease-riddled Europeans, carrying tuberculosis across the Atlantic, have long been blamed for wiping out huge populations of Native Americans. But new research has found that the deadly bugs which killed millions were probably spread by seals and sea lions, long before Christopher Columbus first arrived in the New World in 1492. A study which looked at tuberculosis strains in bones discovered in Peru found they were closely linked to those found in sea mammals. "Our results show unequivocal evidence of human infection caused by sea lions and seals in pre-Columbian South America. I can't comment on the history of South America; in North America it's true that there was evidence of depopulation (in the desert Southwest and at Cahokia) before the arrival of Europeans), but there is also well-documented eyewitness evidence of the ravages of diseases brought by the first Europeans. I don't doubt that seals may have spread mycobacterial disease to humans (perhaps nontuberculous mycobacteria, labeled "tuberculosis" in the article), but I can't envision any mycobacteria (even M.Tb) causing the biblical-level depopulations experienced in North America. According to The Moscow Times, Russia is demanding that Bulgaria take steps to prevent vandalism of soviet statuary. 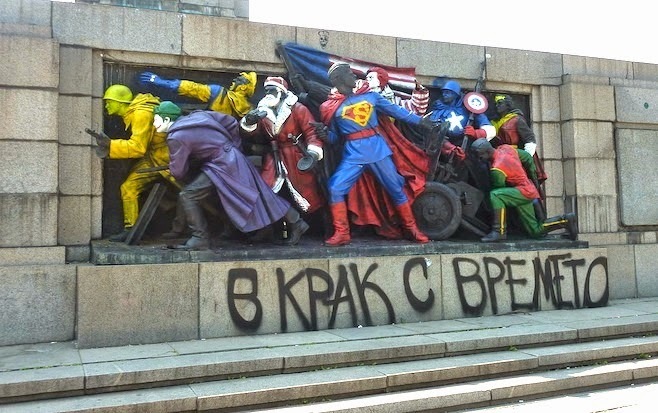 On June 17, 2011 the monument was painted overnight by unknown artists, who "dressed" the Soviet Army soldiers as American comics heroes and characters: Superman, Joker, Robin, Captain America, Ronald McDonald, Santa Claus, Wolverine, The Mask, and Wonder Woman, with a caption underneath which translates as "Abreast with the Times" (in Bulgarian "V krak s vremeto", literally "In pace with time"). The monument was cleaned in the late hours of June 20, 2011. The event was widely covered by the international media and provoked serious pro and anti-Russian discussion in the Bulgarian society. The story was filmed in the short documentary In Step With The Time directed by Anton Partalev and includes anonymous interviews with the artists. The film won the second prize in 2013 IN OUT FESTIVAL in Poland. Anyone who received treatment from a network-owned hospital in the last five years -- or was merely referred there by an outside doctor -- is affected. ... but I do keep track of all the books I've read. I rate them on a scale of 0-4+, so that when I get old(er) and (more) demented, I'll know which ones to re-read. For the past 25 years, here are the 92 books I've rated 4+ (to be honest, it also includes a fair number of 3.5s), out of a total of 700+. Witchcraft, Magic and Religion in 17th century Massachusetts. 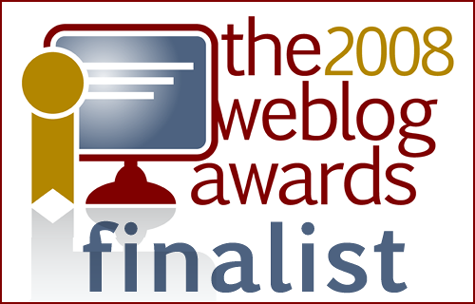 Sometimes I post reviews in the recommended books category of this blog. Please feel free to chime in with a comment about your favorite books.